There are a variety of different bedding options used in dairy barns including straw, sand, cement floors and rubber mats. How does it assist or impede with managing cow waste including urine and manure? How will the cows be impacted by this type of bedding? How much does it cost to establish and maintain? On the downside, a compost barn requires more space compared to the standard free stall barn. Also, large quantities of dry 'input' materials are needed. On the plus side, compost packs are excellent at manure management and create a very positive environment for the cows if managed properly. At Mapleton's, we also considered how well each bedding option fit with organic farming practices. Without much hesitation, installing a compost pack became the best choice for Mapleton's. Following we've outlined some of the details involved with the compost pack and it's maintenance. At the start of each cycle, the compost pack consists almost entirely of sawdust – to a depth of 12 inches. The sawdust is from the kiln dried, untreated lumber of recycled pallet skids. After the initial start of the compost pack, it's depth ebbs and flows. As the ladies deposit manure, and sawdust is added, the compost pack becomes higher. At times, it's depth or height will also drop as composting takes place. To keep the compost pack in top shape, and working properly, it is cultivated each morning and night – usually by Arwa. This mixes the manure into the pack and also aerates it allowing for better decomposition. In the winter, the heat of the compost pack creates an interesting challenge. As the pack is cultivated it releases heat, filling the barn with steam and creating near white out conditions. Arwa will make a point of cultivating right after feeding the cows so that they are safely to the side in the feeding alley as she slowly and carefully moves through the thick fog. Every 2 weeks an old potato hiller is used to do a deep mix of the pack. This piece of equipment allows Arwa to dig down and mix compost from the bottom of the pack to the top. The compost pack increases the need for good air movement. In the Mapleton's barn there are large fans and the side walls have curtains. The curtains are automated to open and close as needed to maintain specific temperature and humidity levels within the barn. Fans are also operated by automatic controls. 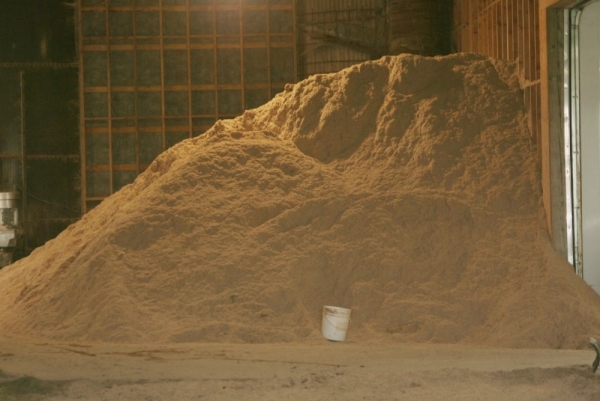 Sawdust is regularly added to the pack to keep it from becoming too moist. There is no set schedule for this as it depends on the weather and humidity. One of the factors Arwa and Martin watch for is how long the compost pack clings to the ladies after they stand up from laying on it. If the material clings to the cows for a few minutes, it indicates it is moist but not too dry. If the compost pack material takes more time to dry and fall off, it indicates the pack is too moist. These are good visual clues. Arwa also monitors moisture by observing how the tractor moves through the pack during cultivation and by simply grabbing a handful of the pack and seeing how it feels. In the end the compost pack can be more costly than other options and requires regular maintenance. However, the benefits are many including a wonderful environment for the cows, and nutrient rich compost for the fields at Mapleton's. To learn more about the benefits of the compost pack to the cows visit here.